Model for the ind. param. What kind of plots can be generated by Monolix? The list of plots below corresponds to all the plots that Monolix can generate. They are computed with the task “Plots”, and the list of plots to compute can be selected by clicking on the button next to the task as shown below, prior to running the task. By default, only the subset of plots are selected, as one can see on this figure. 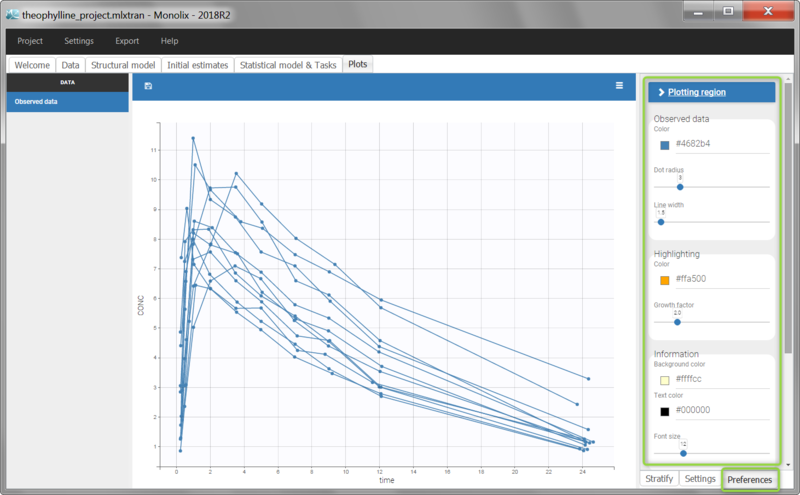 Plots can be selected or unselected one-by-one, by groups or all at once. In addition to selecting plots, this menu can be used to directly generate one particular plot, by clicking on the green arrow next to it, as can be seen below. The green arrow is not visible if the required information for the chosen plot has not been computed yet. For example, generating the plot “likelihood contribution” requires first to run the “Likelihood” task. Observed data: This plot displays the original data w.r.t. time as a spaghetti plot, along with some additional information. Individual fits: This plot displays the individual fits: individual predictions using the individual parameters and the individual covariates w.r.t. time on a continuous grid, with the observed data overlaid. Observations vs predictions: This plot displays observations w.r.t. the predictions computed using the population parameters or the individual parameters. Scatter plot of the residuals: This plot displays the PWRES (population weighted residuals), the IWRES (individual weighted residuals), and the NPDE (Normalized Prediction Distribution Errors) w.r.t. the time and the prediction. Distribution of the residuals: This plot displays the distributions of PWRES, IWRES and NPDE as histograms for the probability density function (PDF) or as cumulative distribution functions (CDF). Distribution of the individual parameters: This plot displays the estimated population distributions of the individual parameters. Distribution of the random effects: This plot displays the distribution of the random effects. Correlation between random effects: This plot displays scatter plots for each pair of random effects. Individual parameters vs covariates: This plot displays the estimators of the individual parameters in the Gaussian space (and those for random effects) w.r.t. the covariates. Visual predictive checks: This plot displays the Visual Predictive Check. Numerical predictive checks: This plot displays the numerical predictive check. BLQ predictive checks: This plot displays the proportion of censored data w.r.t. time. Prediction distribution: This plot displays the prediction distribution. SAEM: This plot displays the convergence of the population parameters estimated with SAEM with respect to the iteration number. MCMC: This plot displays the convergence of the Markov Chain Monte Carlo algorithm for the individual parameters estimation. Importance sampling: This plot displays the convergence of log-likelihood estimation by importance sampling. Likelihood contribution: This plot displays the contribution of each individual to the log-likelihood. Standard errors for the estimates: This plot displays the relative standard errors (in %) for the population parameters. 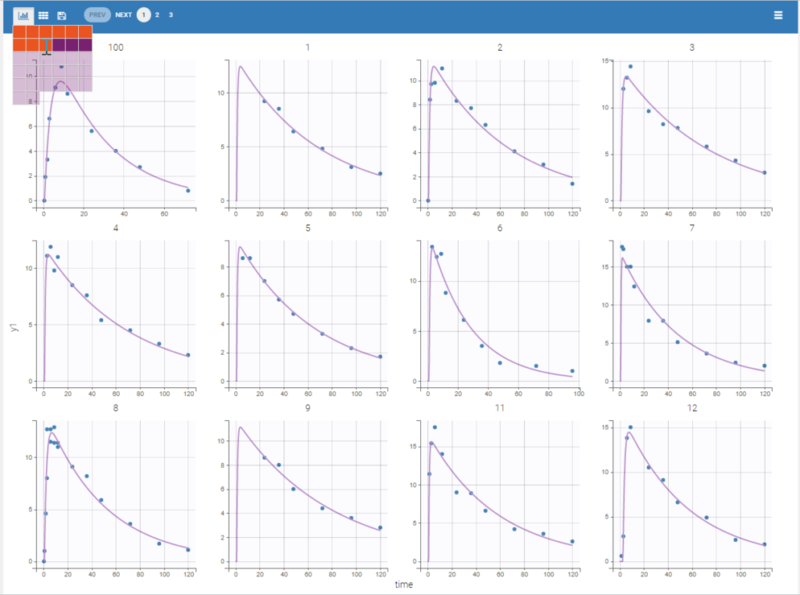 The tab “Settings” provides options specific to each plot, such as hiding or displaying elements of the plot, modifying some elements, or changing axes scales and limits. The tab “Stratify” can be used to select one or several covariates for splitting, filtering or coloring the points of the plot. See below for more details. 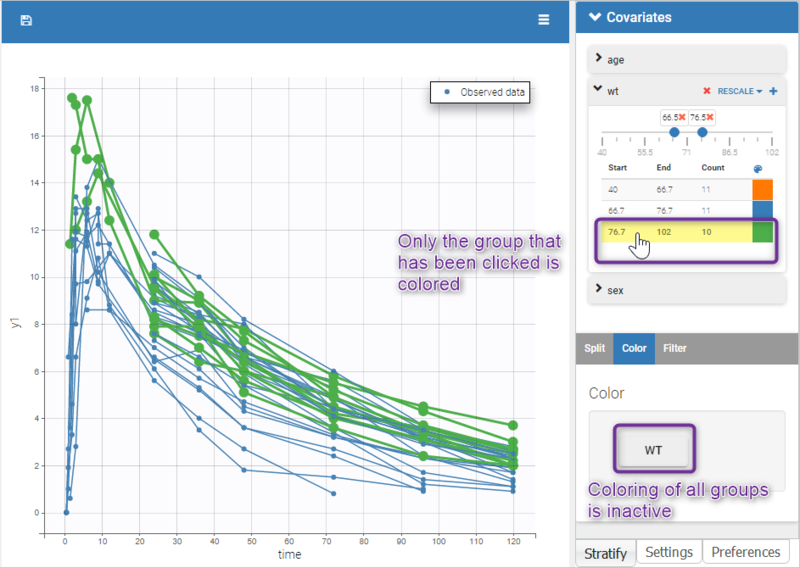 In all the plots, when you hover a point or a curve with your mouse, some informations are provided as tooltips. 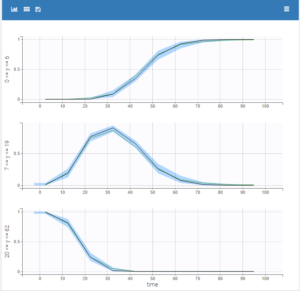 For example, the ID is displayed when hovering a point or the curve of an individual in the observed data plot, the ID, the time and/or the prediction is displayed in the scatter plot of the residuals. In addition, starting from the 2019 version, when hovering one point/ID in a plot, the same ID will be highlighted in all the plots with the same color. 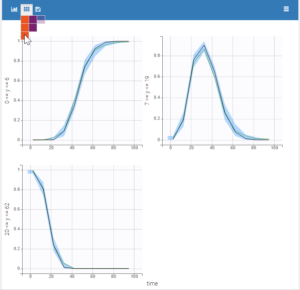 The stratification panel allows to create and use covariates for stratification purposes. 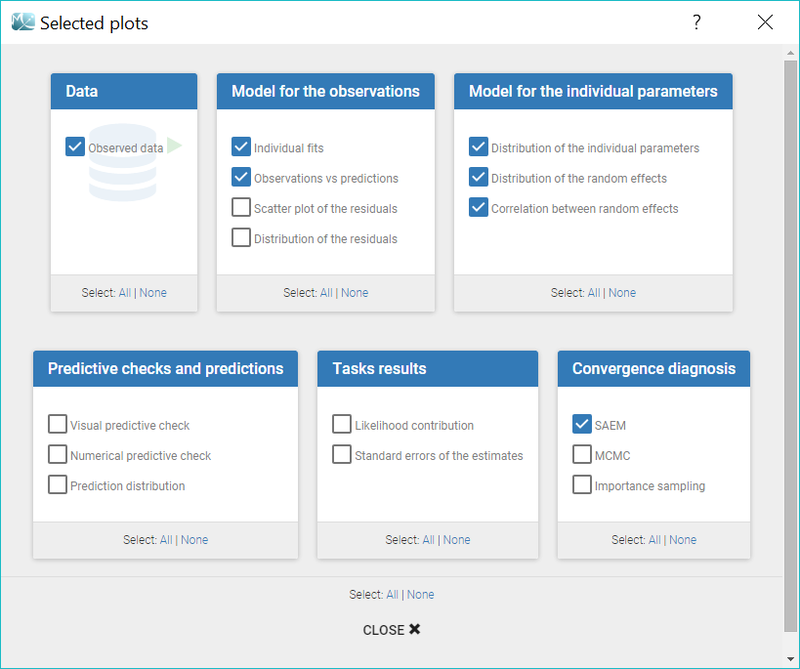 It is possible to select one or several covariates for splitting, filtering or coloring the data set or the diagnosis plots as exposed on the following video. 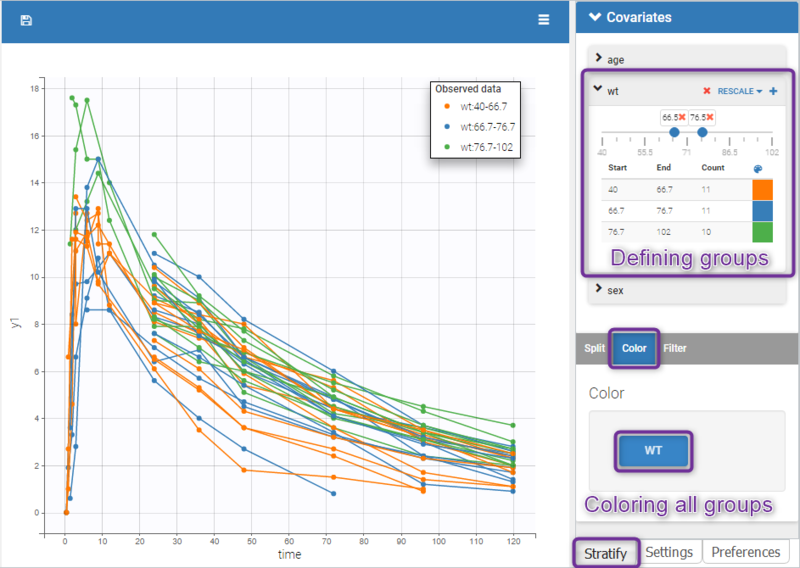 The following figure shows a plot of the observed data from the warfarin dataset, stratified by coloring individuals according to the continuous covariate wt: the observed data is divided into three groups, which were set to equal size with the button “rescale”. It is also possible to set groups of equal width, or to personalize dividing values. In addition, starting from the 2019 version, the bounds of the continuous covariate groups can be changed manually. Values of categorical covariates can also be assigned to new groups, which can then be used for stratification. 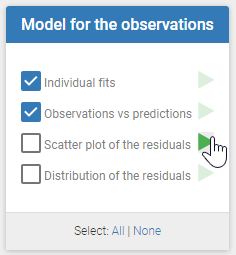 In addition, starting from the 2019 version, the number of subjects in each categorical covariate groups is displayed. The following figures show on the theophylline demo the choices for the plot content and the choices for the labels and titles (in the ‘Plotting region’ section). The layout can be modified with buttons on top of each plot. 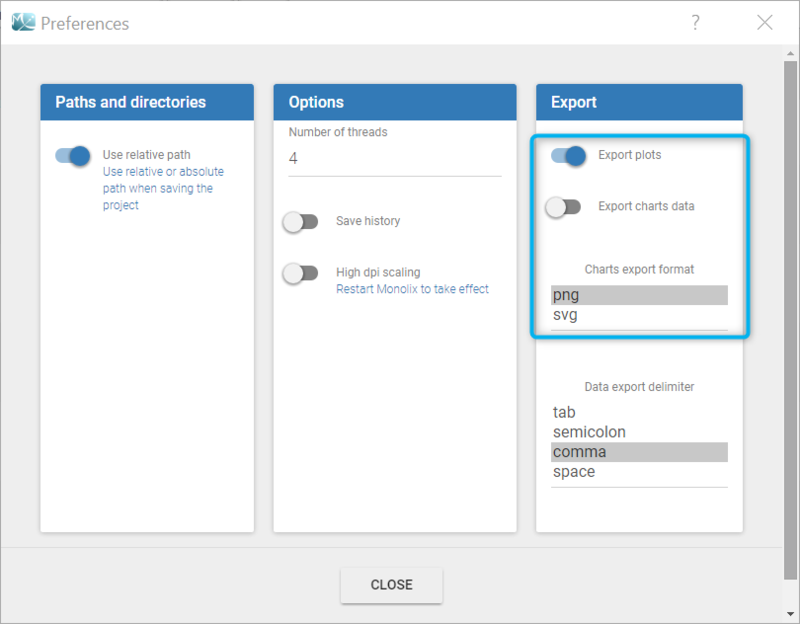 The first button can be used to select a set of subplots to display in the page. For example, as shown below, it is possible to display 9 individual fits per page instead of 12 (default number). The layout is then automatically adapted to balance the number of rows and columns. The second button can be used to choose a custom layout (number of rows and columns). On the example figures below, the default layout with 3 subplots (left) is modified to arrange them on a single column (right). The user can choose to export each plot as an image with an icon on top of it, or all plots at once with the menu Export. 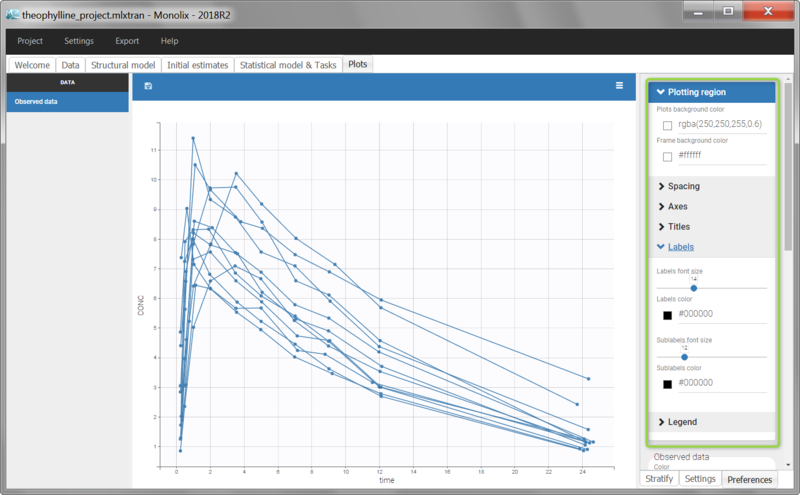 It is also possible to export plots data as table, for example to build new plots with external tools. legends and information frames are not exported.